I am you, I am your head, I am your brains. Let me explain the reason you are seeing this: you are hallucinating. Terrifying huh? But true nonetheless. This forum does not exist, nor are you looking at it. You are imagining things and I (your mind) am playing tricks with you. You have been wanting Crusade Gaming back so badly for over a year now. I have heard you think it. I have seen you dream it. You wake up crying because you miss those old times so much. You can't think clearly any more. To fill up that gap you are now seeing things and this is the result. It is absolutely impossible that someone other than Silent has gotten control of the crusadegaming.com domain, you should realise that. Surely you don't think Silent would be silly enough to let it expire? That is preposterous! Honestly, if I would have written this post (which I haven't of course, as it does not exist), I would be laughing at you. Very loud. And rolling over the floor too. Ever seen a mind rolling over the floor laughing? No? Good, you're not too far gone then. Still, go see a doctor. And should anyone happen to get the domain, surely no one would be silly enough to attempt to revive Crusade Gaming? No, that's not going to happen. Seriously. Read this post your imagination again and tell me differently. It is not possible, nor is it going to happen. Ever. After about a week and a half of work, we have implemented the details pertaining to the items mentioned in the title. I thought I'd outline them here for you. 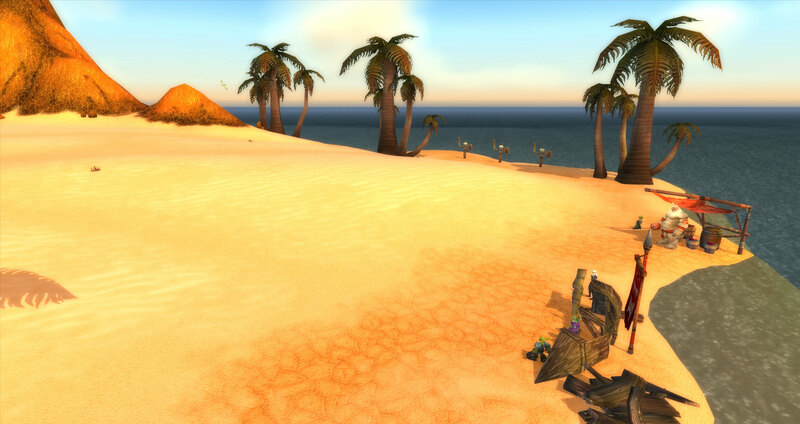 On your initial login, following character creation, you will be presented with a storyline and left with a decision to make - pursue the normal track to battle against the Lich King (hereby referred to as the normal track), or pursue the PvP track to defend your faction against the opposite faction (hereby referred to as the PvP track). If you do not make this decision, you will be reminded every 60 seconds to do so. Any action in-game would require you to have first specified your track. There will be certain restrictions in place for any track you choose. Normal track players will not have access to the PvP vendors in the PvP-only malls (these are currently being built). Other than that, they will have unhindered access to the game, and are free to forge their own destinies. 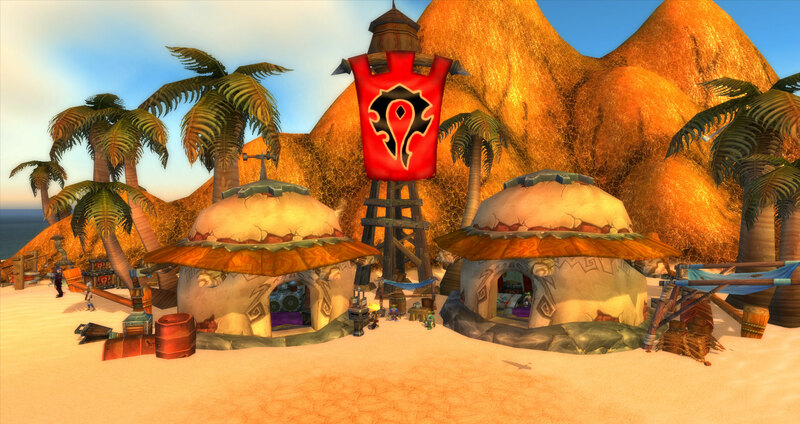 PvP track players, however, will not be allowed to access dungeons/raids, use the Dungeon Finder, accept quests, use the Auction House, or loot creatures. In addition, cross-track interactions such as guild invites, mails, and/or trade will not be possible. Players of different tracks may, however, party up, and participate in arenas/battlegrounds with or against each other. Players that are adamant about not choosing a track will have all of the above restrictions. As far as the PvP system goes, PvP track players will always be flagged regardless of where they might be (with the exception of sanctuaries), and consequently always attackable. Normal track players will have the option to flag themselves if they want to join the fray, or will be automatically flagged if they attack a hostile player from the opposite faction (either a PvP track player or a flagged Normal track player) or enter PvP areas such as the opposite faction's capital cities and/or arena/battleground/FFA areas. All class spells (excluding those obtained from class quests) and weapon skills will be auto-learned as you level or learn new talents (MoP-style quality of life feature). For PvP track players, riding skills will also be automatically learned. Normal track players will have to learn these themselves. Normal track players will be allowed to set their own leveling rates, anything from 1x to 15x, or purchase instant boosts to levels 60, 70, or 80. PvP track players will be instantly boosted to level 80 on track selection. As mentioned above, spells and skills will be automatically learned, where applicable. You can have Normal and PvP track characters on the same account, but the same cross-track restrictions against guild invites and mail will apply. I think we are about 75% done with "merging" Nef and Maly with this . If I have forgotten anything, I'll add it in a follow-up post. For now, I'd love to hear your comments. One of Crusade Gaming's main problems in the past was the staff. There was a large amount of different ranks, people were always trying to get higher up on Staff often only to become inactive afterwards, instead of just doing what they were good at. There was also a lot of Staff abuse going on, often unnoticed by the (inactive) higher ups. That's not something we want to repeat. Instead of having a top-down structure like we used to, we are now setting up the staff as teams. There will be a team for in-game Support (Game Masters), for building and running events, for forum and IRC moderation, for development, etcetera. A Staff member can be part of one or more teams, depending on where he/she is needed and what he/she wants to work on. Teams can of course also change as needed. If we're planning a project that requires a lot of work, we'll just set up a team for it and get the required manpower in the team. Teams will be lead by the Team Leads. The role of Team Leads will be comparable to Admins and Lead GMs on the old Crusade Gaming. That is also the only higher rank we have for now. We simply don't see a need to add more positions on top of that. Choosing a Lead for a particular team is purely a practical decision: whoever is best suited for a position at the time gets to lead the team. When someone goes inactive, or simply when there is someone else who can get more done, positions will be switched, temporarily or permanently. So for example, if I would go on vacation for a few weeks, I would pass on leadership for my team to someone else. In the end it's Crusade Gaming that matters, not a fancy colour on your name. Another update from your dev team. I know you probably think this has been long due, but I can only work on CG on nights and weekends. I have a wonderful job that keeps me occupied on the weekdays. ANYWAYS. 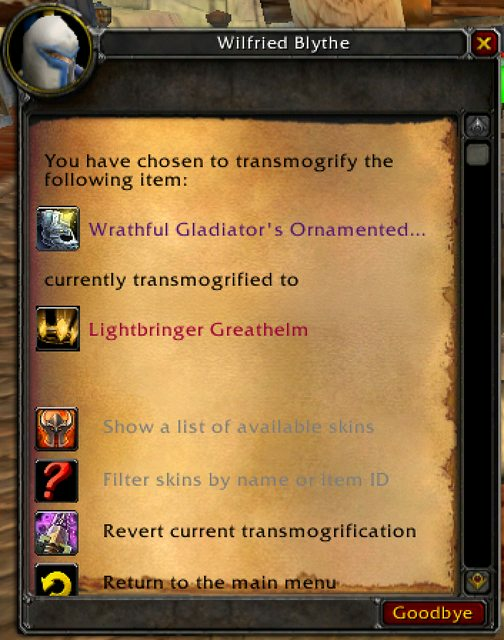 I'd like to say a few things about transmogrification. I've been working on this for about a week now, and I'm happy to announce that its finally complete. 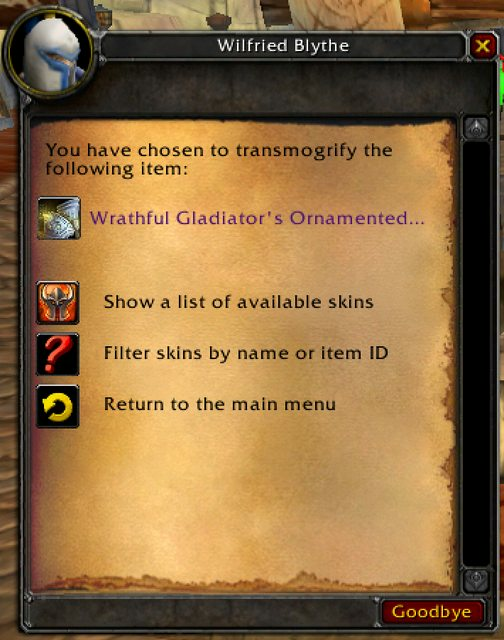 First, you will be presented with a list of slots that you can actually transmogrify. If you have a valid item in that slot, you will be able to click on it and proceed to the next menu. In the next menu, you will have the option to either browse your available skins - all valid items from your bags/bank for normal track players, and preset items with rating requirements for pvp track players. If this list is too long for your liking, you may also choose to filter it by a partial item name or the item ID. 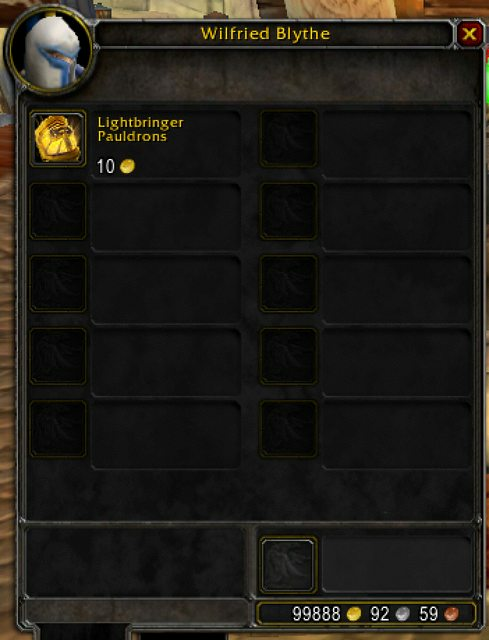 Simply buying the item from the "vendor list" will apply the transmog to item in the desired slot. 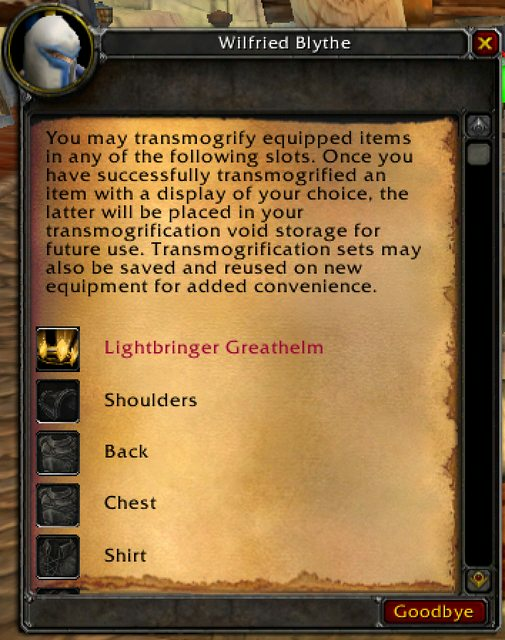 Once you transmogrify an item, the skin will be placed in your "transmogrification void storage". As long as this skin is present in this storage, you will be able to use it even if you have deleted the actual item. If we are only interested in an item's look, why save space in our bags for it, right? Let me elaborate. Say you have an ugly helmet currently equipped - let's call it Faceplate of the Ugly. You ALSO have an item with an amazing look somewhere in your inventory or bank (NOT guild bank) - lets call this Mask of the Divine. You visit the Warpweaver and you choose to transmogrify Faceplate of the Ugly to Mask of the Divine. Both of those items now become soulbound to you. Now say you are forced to delete Mask of the Divine since you need space for this awesome new gear piece from ICC - lets call this Faceplate of the Clinically Ugly. AND you just deleted your beautiful skin...right? No. Mask of the Divine was already thrown into your "transmogrification void storage" the first time you used it for a transmogrification. Now you may STILL transmog Faceplate of the Clinically Ugly to Mask of the Divine, and save yourself from inevitable ridicule. We may also save specific looks into what we call transmogrification sets. Each character may have up to 10 sets, and reuse them on valid equipped items as they see fit. Fully transmogrify your PvE set, save the set, and just painlessly apply it to your PvP set to achieve the same look. Simple. If you guys have questions or comments, I'd love to hear them. After some time, the malls are pretty much done. Before I start, I would like to explain the ideas behind the malls. It is a mixed PvP/PvE hybrid server and the PvP malls could not interfere with the "normal" world. That is why the malls now are placed at a separate, non accessible for PvE players area. However, there will be plenty of room for raiding malls and so on, since they are not counted as a sanctuary. The malls were designed to be as user friendly as possible. This is why you will never have to train your weapon skills, move across the mall multiple times to find what you seek for, or get lost in a crowd of NPC's again. Because in the end, you want to get your gear on as quickly as possible and start to PvP. These past days we have been overwhelmed by everyone's activity and involvement on these forums and our IRC chat. It is wonderful to see the community coming together again so quickly after such a long period of inactivity. The main question everyone has been asking is: is Crusade Gaming coming back again? I don't want to make promises that we can't meet, but we are going to try! 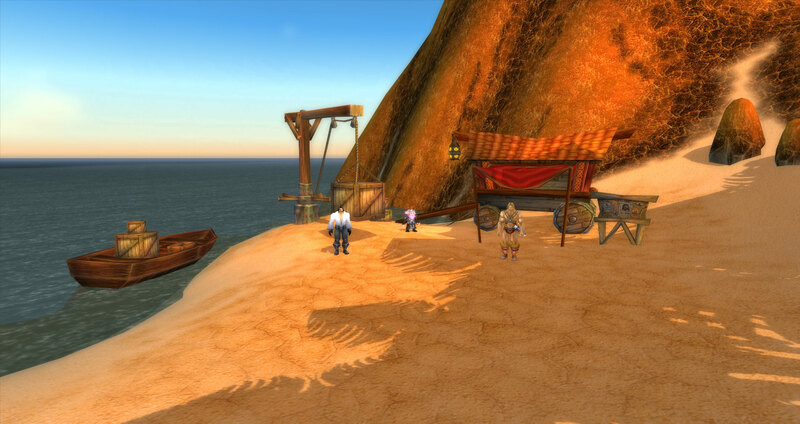 Hash (who most of you will remember as Ectomy) is already working with a group of beta testers on a test realm. There is still a lot of work to do though. Right now the realm is just a stock TrinityCore, and we want to give you all a bit more than that. We don't want to launch with a crappy server, we want to have a spectacular launch. CG died out like a candle a year ago, now we want to come back with a big BANG! That means we will need some time to prepare and develop everything we need. It's too early to give a time frame. It could be a few months, it could also be less. We are not going to make any promises until we can be absolutely sure we can meet them. We ask for your understanding in this. I know it is frustrating to wait, but we are working on our own pace. Both Hash and I have full time jobs, so we do what we can in the evenings and weekend, but we're not going to push ourselves too far as we don't want to risk any kind of burnout. While we are working on things and plotting ideas we will start posting regular updates. In those threads you will also be able to give your input on what we are working on. We will hear your voices! See you all soon on IRC, TeamSpeak and these forums! No donation items is kinda fair game. As you may have seen the voting system was put live yesterday. You should now see a box at the top of the forums every 12 hours asking you to vote. I had some reports about Chrome not being able to see the vote box. That should be fixed now. If you are still having issues, could you please post here which browser and version you are using? We'll let the beta-testers have at it - give the system a good shaking to see if it can hold its own. A first pass of tests yielded very promising results. Ye, unlike old CG, where you could get donation items with the same stats as Wrathful. Freaking unfair. Will there be any donation points refounds? If the server was called PotatoGaming instead of CrusadeGaming 2 would you ask the same question? Can you also choose XP rate on top of starting level? Yes Aidiakapi. If you do choose to level, whether you start at 1, 60, or 70, you will have the option to specify your leveling rate. 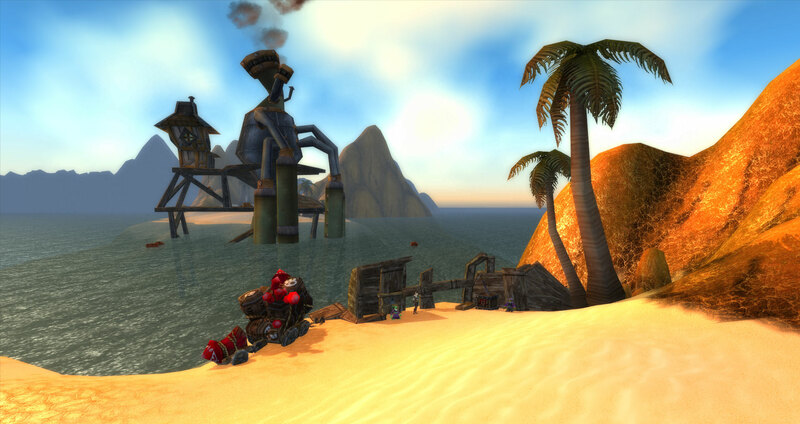 In fact, unlike other servers that might have this feature, you can change your leveling rate at ANY TIME you want. For instance, you may speed up the 1-20 grind, and slow down after that when you have a mount. The rewards that you receive from leveling will depend on your average overall leveling rate and your current level (more rewards for lower rates and higher levels). If you do choose to boost to a higher level, your experience for those boosted levels will be calculated as having been obtained using double the maximum possible rate (TBD). I hope this answers your question. Please note that these ideas are purely conceptual right now. When we do prototype them, some details will inevitably change. Rest assured that we will keep you guys apprised throughout the development process. Much respect for every staff member. Besides Nelica of course, he's a queer. There has been a lot going on behind the scenes lately, and I think it would be good to give you all a quick update. Kaiyn has recently returned to Staff. He has mostly built Maventell for us, and is now the Team Lead for both Events and Game Design. Mostwanted, Acoolername and Saeada have recently joined Staff for Support and Events. They will mostly be handling your tickets and providing entertainment in-game. With such a small Staff it remains difficult to cover all time zones, but we will of course try to have as much GM presence as possible. Cawks and Hawk have joined the Game Design time for PvE. If you have any suggestions or thing you think should be changed: please contact them. They will decide what direction we want CG to go in, and give the development team guidance on what to work on. Several inactive Staff members have unfortunately been removed. While none of them actually did something wrong, we would rather have a small active team than a bigger team with lots of people who aren't around. I will be focussing more on development myself from now on, instead of only events and support. More development = more fixes and new features more often. There's still a lot to learn for me, but I'm pretty confident I'll be able to catch up fairly quickly. We are looking for someone to help us out in general marketing. There's still a lot to be gained in that area. Things like advertising, finding the best vote sites to be on, building up hype for upcoming releases, etcetera. Development spots are of course always open. Are you familiar with SQL or even C++? We'd love to get in touch with you. Game design could use a PvP-guru to guide the server towards a better and more streamlined PvP-experience. Of course, you could also apply for multiple roles if you have sufficient time and motivation to do so. Just let us know in your application. #2232 Are You Ready For Halion? Are you ready for Halion? The work is complete. Code has been written. Players have been consulted. Forums have been trolled. Chocolate has been eaten. No gnomes were ever harmed in the process. After months of development, we are overjoyed to announce that Halion will soon be officially open to the public. Please keep in mind that you can login to the game using your forum account. If you've had your forum account for quite some time, you will have to sync your forum account to your in-game account before logging in. You'll only have to do this once. New accounts do not need to sync manually. Have troubles connecting? Check out this guide, or ask us on IRC. Have other questions? Feel free to make a thread over at our support section. First of all, merry Christmas to everyone! In the Staff meeting last weekend we agreed on promoting Krozan to Team Lead for the Marketing Team and Versatile to Team Lead for the Game Design team. Congratulations to both! If you have any questions, suggestions or comments related to Marketing or Game Design, they are the people you'll want to talk to. We have installed a new application on these forums that allows users to publish any streams they have on twitch on our site. You can find it here. This way you can easily share your streams with the rest of the community, and we'll have all CG-related live streams in one place. Feel free to test it out. At the moment streams are not yet moderated, but we might add moderator approval to the system later if needed. Long forum links can be annoying, especially if you want to share the link with others on social media, by email or on IRC. We have purchased the domain http://crusadegam.in and will be using that to generate shortened urls for anything important on the site and forums. If you'd like a shortened url for a thread you made to easily share it, please contact the marketing team for now. We might come up with a more sophisticated system for it later, but it has no priority for us at the moment. We are confident we can launch in January. You can consider this a promise. One that we, unless very bad unforeseen personal circumstances arise, will definitely keep. Unlike promises on old CG, this is a very realistic promise with a very realistic time frame. One that we're ready for. So yes, you will be able to play on our servers in January. Probably somewhere mid-January. When we are completely ready for launch, we will of course post an exact launch date, put it on the forum calendar, post it on Facebook, send out e-mails, etcetera etcetera. You won't be able to miss it!